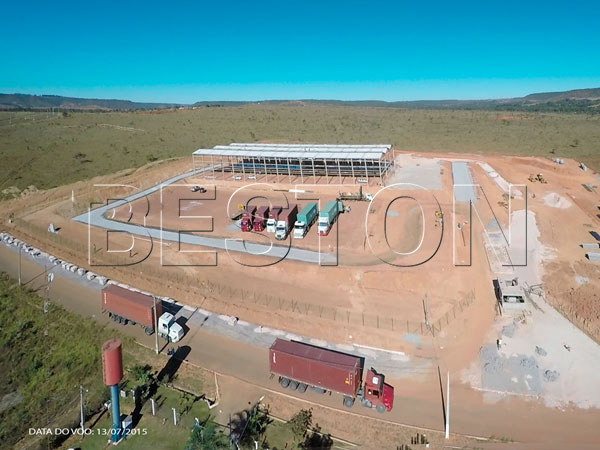 Beston waste tyre recycling plant refers to processing waste tyres into fuel oil through pyrolysis technology. It is an amazing machine that can turn waste tyre into useful and valuable end products. Meanwhile, the usage of machine is good for environment friendly through solving the waste tire stacking problem. So, the tyre recycling plant is popular on the market now. 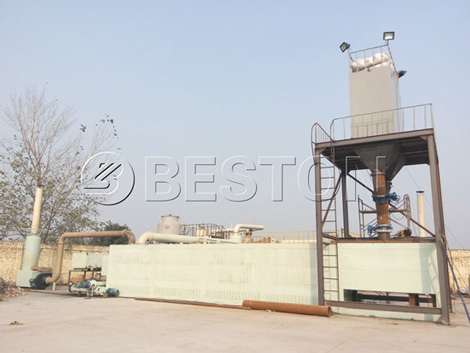 Beston provides the most reasonable and competitive waste tyre recycling plant price for you. 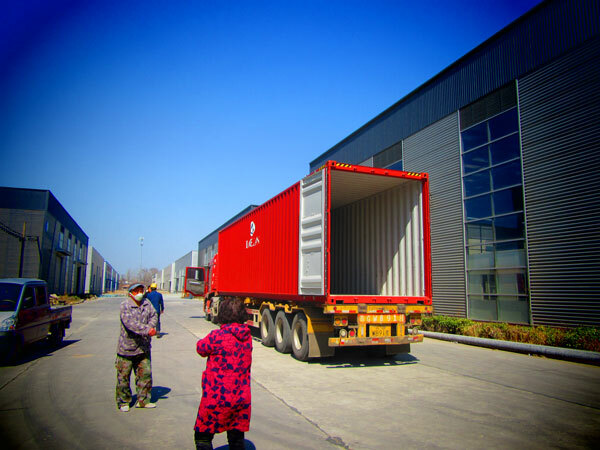 Our machine has been exported to countries all over the world. Why We Need Waste Tire Recycling Machine Urgently? Waste tyre is called “black pollution” by people due to its characteristics of degradation resistance, mechanical resistance and heat resistance. With the development of society modernization, cars are common for every family. The “black pollution” problem is becoming more and more sever. Therefore, we need the waste tire recycling machine(another name: waste tyre pyrolysis plant) urgently to solve the current problem. 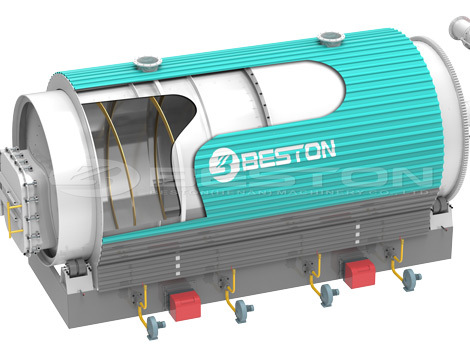 We Beston Machinery can supply you the batch, semi-continuous and fully continuous recycling pyrolysis plant. Six models for you: BLJ-6, BLJ-10, BLJ-16, BLL-20. Get the tyre recycling machine price now! The quality of spare parts of tire recycling machine for sale: the plant mainly consists of reactor, casing, oil gas manifold, oil sluge tank, oil gas condenser, oil storage tank, hydroseal, dedusting system, automatic slag removal system. All the spare parts, adopting high quality raw material, have long service life time. High quality raw material to make spare parts need to pay high price. Then, waste tyre recycling plant cost will be higher correspondingly. If you choose find tire recycling machine price is lower than the market common price, you should pay attention to the machine’s quality. The scale of tyre recycling manufacturing factory: large scale factory has more skilled workers and mature technology that can assure the quality of machine and productivity. 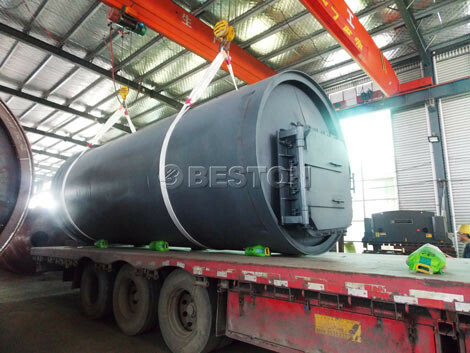 Like we Beston Machinery, we can manufacture the whole waste tyre recycling plant with less workers and less time. Accordingly, the tyre recycle plant cost will be reduced. 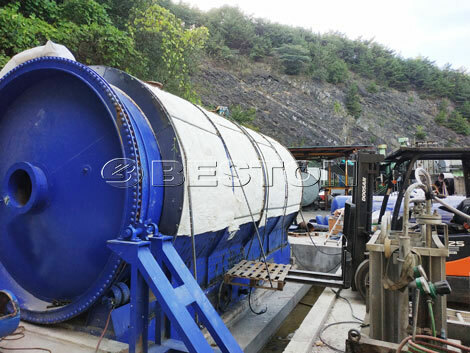 We Beston Machinery tyre recycle machine price is the most reasonable and competitive. The above are the factors for affecting tyre recycling machine cost. If you want to know more about tire recycling machine cost, you can contact us. Cost of preparing the factory: when you want to do tyre recycling business, you should prepare the the factory. In the process, the cost of land, brick, cement, sand, steel would be different because of the local market. 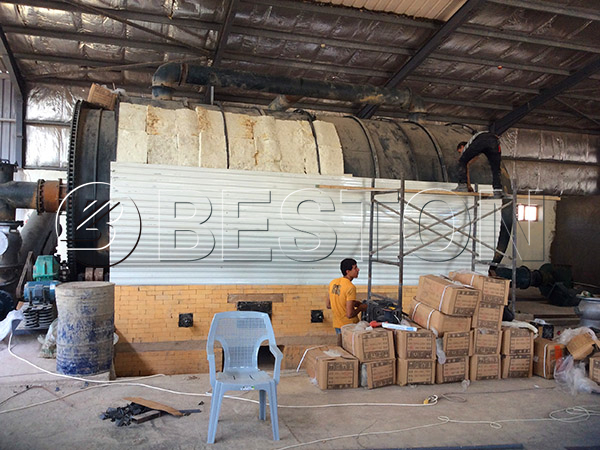 You may need to prepare larger occupied area for fully continuous recycling pyrolysis plant. Cost of installment workers: skilled workers are needed. Especially the welders should have rich and superior working capacity. You need hire skilled workers to make sure the installation process. 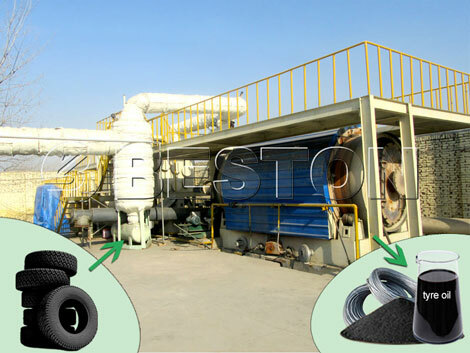 Cost of tyre recycling plant: tire recycling plant price is different because of different types of the plants. You can tell us your budget and capacity demand. We will give the appropriate machine for you. The reasonable and low tire recycling equipment prices of we Beston Machinery have greatly reduced the investing cost and leave a large profit margin for customers. 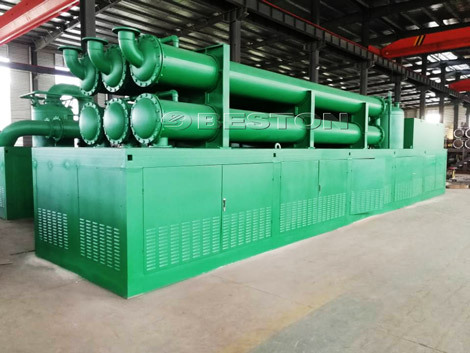 High oil output: we Beston Machinery have come forward the new technology of improving the oil output that can increase 5% oil with the same machine. Avoiding being burnt: the plant adopts advanced technology which can prevent the phenomena of breaking out a fire during the process of discharging slag, opening the furnace door and taking out steel wires. Thereby, the safety of operators can be guaranteed. Automatic operation: the full automatic plant has auto tire shredding system, auto feeding and carbon/steel discharging system. 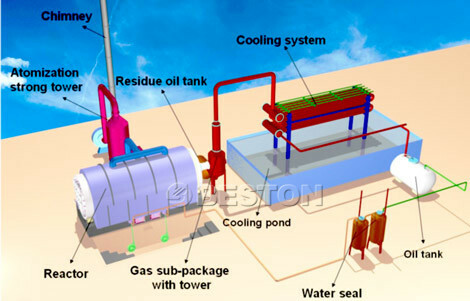 Four-layer dust removal system: water washing, magnetic ring adsorption, activated carbon adsorption and water spray. Through the four layer dust removing, exhaust gas will be purified to meet the European pollution control standards. 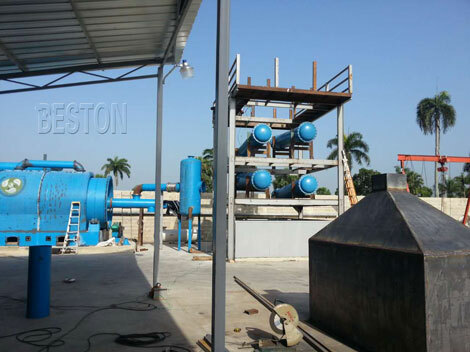 Compared with the advantages of the plant, you will discover Beston waste tire recycling plant price is quite reasonable and affordable. Our plant has greater flexibility and can be suitable for dealing with any type of tires and processing them into fuel oil, carbon black and steel wire. The most special feature of Beston tire recycling machine is that the high-value products from each phase can be widely utilized in a range of different industries. 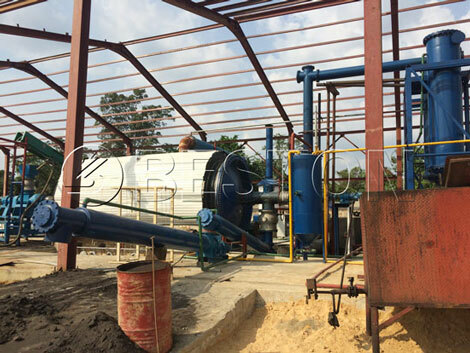 We also have high quality pyrolysis plant for plastic recycling for sale. Get the latest price of tyre recycling plant and tire recycling equipment cost detailed analysis now!